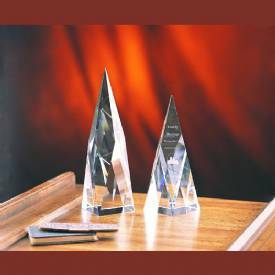 Product Description: This optical crystal apex award has a beautiful flat polished face. Engraving your corporate logo and text will display well on this very clean crystal award. Size: Small - 8"H x 2-3/4"Sq. Large - 10"H x 2-3/4"Sq.